A recent report published by Infinium Global Research on air conditioning systems market provides in depth analysis of segments and sub-segments in global as well as regional air conditioning systems market. 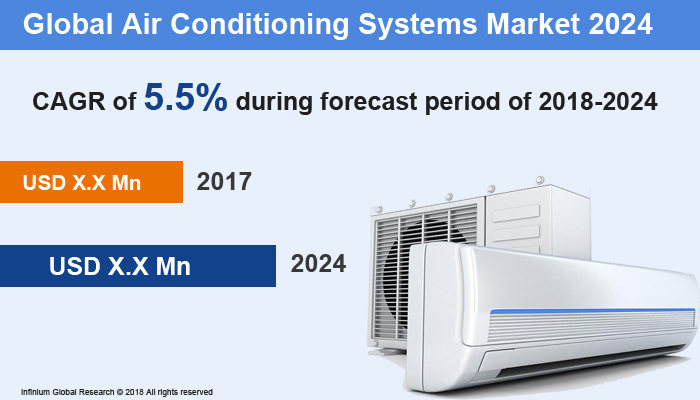 The study also highlights the impact of drivers, restraints and macro indicators on the global and regional air conditioning systems market over the short term as well as long term. The report is a comprehensive presentation of trends, forecast and dollar values of global air conditioning systems market. According to report the global air conditioning systems market is projected to grow at a CAGR of 5.5% over the forecast period of 2018-2024. Air conditioning is the process of changing the properties of air primarily temperature and humidity to more favorable conditions. In construction, a complete system of heating, ventilation, and air conditioning is referred to as HVAC. The main function of an air conditioning system is mainly to produce cool ventilation inside the building in which the heat is taken out from a certain location to give a chilled air effect. Improvement in housing standards is the factor driving the growth of the air conditioning systems market. Additionally, Regulatory norms of electrical appliances have necessitated the production of energy efficient systems and migration from traditional equipment this in turn is fuelling the demand for air conditioners systems market over the forecast period. On the other hand, split air conditioners offers plenty of benefits including less noise, low initial cost and ease of installation. However, individuals using portable systems for trips and other outdoor activities are expected to fuel the growth of air-conditioning systems during the forecast period. Furthermore, manufacturer within the global air conditioning are adopting green technologies and advanced technologies that are making air conditioners systems energy efficient. This in turn is providing several opportunities for the key players in the global air conditioning systems market. Moreover, the trend of green technology and smart homes are expected to create several growth opportunities for the global air conditioning systems. Among the geographies, Asia Pacific is dominating the global air conditioners systems market. The demand for the air conditioners in Asia Pacific is likely driven by the India, china, and japan. Rising number of automobile is contributing to the growth of the Air conditioning market in Asia pacific regions. .Moreover, Europe is anticipated to witness moderate growth owing to the growing awareness about energy-efficient air conditioning systems in building automation, and control has driven their demand in the European regions. On the other hand, the changing standards of American society ongoing technological evolution, and the presence of several regulatory policies have been accelerating the demand for energy-efficient, technologically advanced, and eco-friendly air conditioning systems in North America. The report on global air conditioning systems market covers segments such as, type and end-use. On the basis of type the global air conditioning systems market is categorized into portable air conditioning systems, central air conditioning system, split air conditioning systems, packaged air conditioning systems, chillers and others. On the basis of end-use the global air conditioning systems market is categorized into residential, commercial, industrial and automotive. The report provides profiles of the companies in the global air conditioning systems market such as, Voltas Ltd, LG Corporation, Haier Group Corporation, Daikin industries Ltd, Samsung Electronics Corp, Carrier Corporation, Blue Star, Hitachi Ltd, Whirlpool Corporation and Panasonic Corporation. The report provides deep insights on demand forecasts, market trends and micro and macro indicators. In addition, this report provides insights on the factors that are driving and restraining the global air conditioning systems market. Moreover, IGR-Growth Matrix analysis given in the report brings an insight on the investment areas that existing or new market players can consider. The report provides insights into the market using analytical tools such as Porter's five forces analysis and DRO analysis of air conditioning systems market. Moreover, the study highlights current market trends and provides forecast from 2018-2024. We also have highlighted future trends in the air conditioning systems market that will impact the demand during the forecast period. Moreover, the competitive analysis given in each regional market brings an insight on the market share of the leading players. This report will help manufacturers, suppliers and distributors of the air conditioning systems market to understand the present and future trends in this market and formulate their strategies accordingly.